Former Extra Sales director Sean Boylan was declared bankrupt by the Insolvency Service of Ireland (ISI – https://www.isi.gov.ie) on November 14th 2016 (these ISI links only stay active for a few weeks, this one has now been removed, but we have a copy of the insolvency papers). If you need to contact Mr. Boylan to discuss issues relating to Extra Sales or other matters you can reach him by email at seanboylan1528@gmail.com. He also uses the Irish mobile phone number 089 4630 582. We’ve heard little enough of his fellow former director, Colin Horan, although he is reported to be carrying out much of his business in China these days. 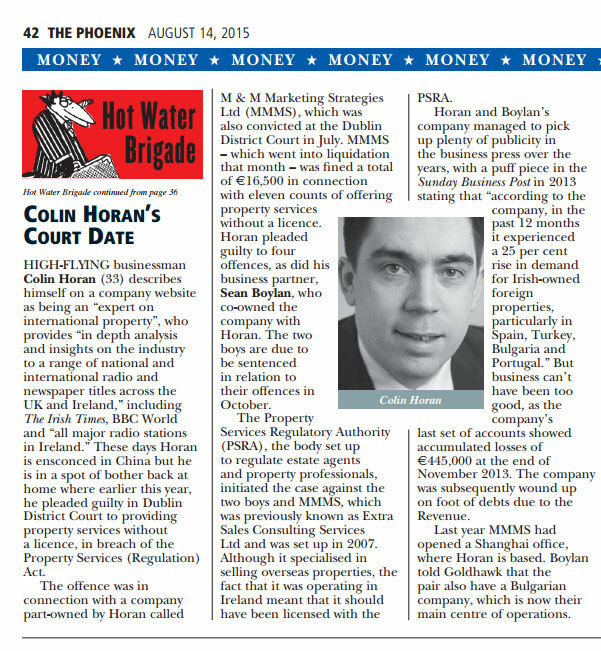 Former Extra Sales director Sean Boylan appeared in court in March 2016 to answer accusations that he misappropriated €42,000 in Turkish sale proceeds from a client – see the report in the Irish Independent here and in the Irish Times here. M&M Marketing Strategies Ltd. t/a Extra Sales went into liquidation on Monday July 6th 2015. The liquidator is Tony McBride of Frank Lynch & Co. If you have any queries you can contact him on 01 841 2470. You’ll get Colin Horan on 087 6932694 or Sean Boylan on 087 988 1234, both are former directors of Extra Sales. The old Extra Sales number of 01 484 7033, also seems to still be in operation. There was a piece in The Phoenix Magazine on August 14th, 2015 relating to the company – see piece at the bottom of this article. As of November 2015 the company is under investigation by the Gardaí on foot of a number of claims that the company sold property in Bulgaria and Turkey, keeping the proceeds rather than passing them on to the property owners. Ironically these guys are also the main actors in a company called ‘Future Wealth‘. It runs with the tag line “We have a successful track record in creating and delivering profitable investments for our clients.” The liquidator and a selection of former Extra Sales clients might want to argue the toss with them on that one. They claim to be based at 88 Wood Street, 10th – 15th Floor, London, EC2V 7RS, UK with a UK phone number of 0044 161 433 8303 and email address of contact@futerewealth.com. As with Extra Sales (see below) I’d not be inclined to trust them with your hard earned money. If you’re considering selling an overseas property and you are based in the UK or Ireland you are met with something of a quandary. It is not until you own a property abroad and head down the road of trying to list and sell it abroad that you discover just how difficult a task it can be. This is particularly the case if you’ve got a property in a country like Bulgaria, where English is not that widely spoken, it can be very difficult to deal with local estate agents and there’s always the presumption that you’re being poorly treated at best or ripped off completely at worst. This is where selling a property with Extra Sales or a company like this comes into play. So that’s it. Extra Sales’ sales pitch is great in theory, but does it work? Does the company, in fact, have the substantial Russian agent network that it claims to have and if you utilise the company will you get results? It appears that somebody feels the company is not all it claims to be and posted this fact on Done Deal. It also appears that the poster had a change of heart on the issue or Done Deal got a warning from somebody. Either way the advert disappeared within two days. Here’s one that stuck, however. It’s on Boards.ie. Yes I am aware of the problems with forums that allow totally anonymous posting – but having said that somebody normally has to be fairly ticked off to bother – or else be a jealous competitor. So you can take this one any way you wish. In the end this guy claims he had to get the Sheriff to reclaim money he was awarded by the small claims court. I’m not for a second suggesting that Extra Sales is doing anything wrong, rather pointing out that somebody obviously feels they’ve been mistreated by the company. Just because somebody feels they’ve been mistreated by the company does not mean that they actually have, but due process can be very difficult to come by when dealing with property in a distant country so people are inclined to take different remedial action to have perceived wrongs righted. The problem with the Overseas Property industry is that it remains totally unregulated. 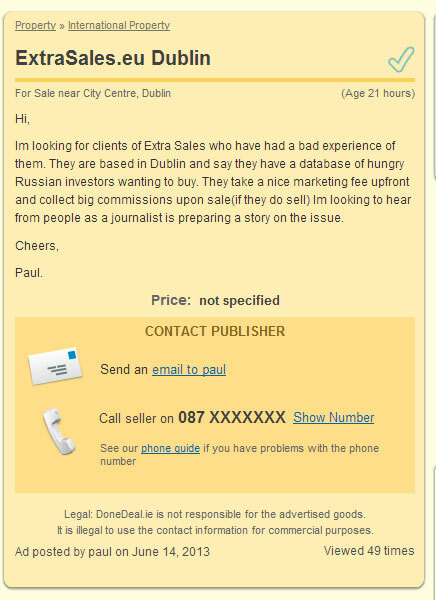 If somebody wants to charge you €1,000 up front to list a property on a website claiming that it is marketing your property to Russian buyers then it is free to do so. You’ve no comeback whatsoever if you find out at a later stage that they’ve actually just stuck it on their website and sailed off into the sunset with your money. You could try the commercial court, but the amounts of money involved are so small that disaffected clients are inclined to just write it down to experience. I’m not sure if this appeared in the Sunday Business Post article, or if it was just the pre-editing version sent to the paper. In any case, it’s merely an aside. The company is also heavily promoting its services through advertising on radio and TV at the moment, which means it will pick up a significant amount of ‘distressed’ sellers. For ‘distressed’ sellers you should also read ‘vulnerable’ in many cases. This also means that if the company is not behaving in an ethical fashion, it will have a large database of disaffected clients in the not too distant future, which inevitably leads to adverts like the one that appeared in Done Deal. Note: If you have had a property listed with an agent for some time and have given that company Power of Attorney (PoA) to sell it for you, then you may wish to get a title search done on the property to make sure that it has not been sold without your being informed. I have recently come across two cases in which this has happened. If you do not know who to contact in order to have a title search completed (any solicitor in the country in question should be able to do it fairly easily) contact me and I may be able to put you in contact with someone who can conduct this search for you. See original here (Thanks to Paul Hayles for the link). 18 mths ago my father and i paid extrasales to sell 3 turkish properties for us, since then we have not been able to see the apts advertised,when we try to contact their office we rarely get a reply and when we were on holiday in turkey we were asked to leave the apt keys with an estate agent in kusadasi for collection. we travelled to kusadasi 9 months later and the estate agent still had our keys awaiting collection. is this company another mac antohny. we have also been told that the 2 contacts that we had within the company have left. Hi Mike, I’m not sure about being another MacAnthony, MRI were on a level all of their own unlikely to ever be surpassed, but from the feedback I’ve had since writing this article Extra Sales certainly have some questions to answer. The reports I’ve been getting would indicate that Extra Sales are very happy to take clients money up-front, but very little seems to be delivered at the business end for that investment. I’ve yet to meet or speak with anybody for whom the company has sold a property, although I’m perfectly happy to speak with one if there is somebody out there who would like to stand up for Extra Sales and its business model. I have been contacted by Derrick Gill in extra sales ,have you had any more information on the selling property in turkey. Damien, I’d give these guys a fairly wide berth if I were you. I’ve heard some fairly hairy stories about them and, once I’ve sufficient documentation, I’ll be doing a proper exposé on them. I suspect a local Turkish estate agent would be a far better option in all honesty. Hi Diarmuid. Did you ever get to do an expose on this company. I’d be interested to hear more. Not so far Trevor, although I am in touch with quite a few people who are having terrible trouble getting paid by them, or even getting proper communications from them. I have a property in turkey and it too is for sale using extra sales, I heard their rep. pitching on my local radio station a few years ago, and i swallowed the lot , paid them up front 1500 euro and heard nothing ,surprise surprise except their monthly bull s**t update. Please expose these tricksters for what they are . Hi, I have a property in Portugal I was thinking of selling. I got in touch with Extra Sales. They quoted me several packages for their service. A ‘Bronze’ package, A ‘Silver’ package, and a ‘Gold Package’. Each ‘package’ from ‘Bronze’ rising in price. All money to be paid upfront! I did not fall for it. I would never, never, pay upfront in order to sell a property. Here is some advice for people thinking of selling in Spain or Portugal or elsewhere. Use a local licenced estate agent and a local English speaking lawyer .Never, ever pay money upfront. Pay only when your property is sold. Also, negotiate the percentage with the estate agent before you put your property up for sale, and get it in writing. Never use a lawyer that acts for the estate agent, use an independent lawyer. Hope this helps. @ Trish Foye, I can’t understand how people can be so gullible. I have looked at your website and it looks so professional. How could you be roped in by anyone looking for money upfront? When I bought my property in Portugal I engaged an English speaking Lawyer and a licenced estate agent. When, and if ,I want to sell it, I will do the same. I was in touch with Extra Sales about selling my property, but, with their “Money In Advance’ scheme I gave it a pass. Russian buyers? Chinese Buyers? Bulgarian Buyers? Are they having a laugh? If you want to sell your property put it up on DAFT.IE. or a local estate agent. in Lanzarote. I think that’s a bit harsh Danny, in fairness to Trish – she was good enough to come on here and outline her experience to enhance the knowledge of others and should be congratulated for that. Extra Sales is very good at convincing people that it can sell a property wherever and, to be fair to Extra Sales it does actually sell some – not enough to justify the up-front fees (take whichever package you fancy, none of them is justifiable), but that’s another argument. The biggest problem I’ve seen since I wrote this post is that even when it sells properties people can’t get their money back from the company unless they threaten Extra Sales with legal action or going to the Fraud Squad. That is no way for a company to behave and is simply indefensible. Hi Diarmaid, You’re right, it was a bit mean of me. I apologise to Trish. It’s just that I went to a “Property Show” some years ago organised by MRI. I made the mistake of giving them my phone number. They haunted me for months on end until I eventually had to tell them to F*** Off. Again, my apologies to Trish and I hope everything works out for her. Diarmaid, Re. people not getting their money from the sale of their property through Extra Sales. If I was to sell my property through Extra Sales or any other company, estate agent or so forth, I would insist that all monies, deposit, final payment, etc. be lodged in MY bank account, otherwise, no deal. I would not allow any third party to collect money due to me. If no money showed up in my account, NO DEAL! Great to see you have opened Pandora’s box on this. I was the one who posted the advert. I’m happy to give you a very very interesting story. I took them to the courts and won. In regards to Trish and her dealings with ExtraSales.Can i ask did she give them power of attorney.Ive had dealings with them which left a very sour taste in my mouth. Im under legal obligation not to disclose the full details of what happened but since moving to Canada I think I can share my experience with anyone whos thinking of dealing with this so called property sales company. If anyone from extrasales is reading this I look forward to seeing you in Canadian court. Well done Diarmaid for exposing these people for what they really are. Paul, I would love to hear your story,Ive got a pretty good one for you. Hi, I was the person who posted the original comment on Done Deal. I have a history with Extra Sales (ES). Back in 09 I had a building project to sell in Bulgaria they told me that I would have a buyer after 3 months deal completed in 6 months. They wanted 5k upfront. I gave them 2.5k to “market” the property. The start of a disaster. they pulled away from me after 3 months and then it was me doing all the chasing. They promised Russian investors were interested and will be “coming soon” they made me look like a real fool with my colleagues in Bulgaria.i still have every text every email with the communication exchanges. Anyway after 3 years of this I asked for a refund. Of course silence. I used the small claims procedure which was ignored by them even though the court clerk said to me the registered letters had been signed for. I won the case by default. They ignored the whole process. I had to use the county sheriffs office to go and get the money. Big lesson learnt. NEVER pay upfront for this. They profess to have “Hungry Russian investors” well if they are so hungry why the need for a marketing fee? I heard their radio adverts, who is paying for these? After my Done Deal advert went up a few people contacted me with MUCH WORSE tales. I will leave it to them to tell their own story. If ES are reading this, you know it happened you are only too aware who I am. Its a LTD company,they will take it as far as it can go ,when things gets too hot they will fold it and its off sking for a few months untill its time for a new company with a new name,a nice new office in Dublin and a new set of marks for them to target. Yes, what’s your contact number? I have come across similar problems outined above, but relating to a different company. ”You’ve no comeback whatsoever if you find out at a later stage that they’ve actually just stuck it on their website and sailed off into the sunset with your money”. It very much is regulated (if the company is operating in Ireland). All individuals associated with the selling and marketing of property must hold a licence regardless of whether or not the property is located here. I suggest that enyone who has a complaint contact the Property Services Regulatory Authority immediately. I’d argue the toss with you on that one. I’ve found that the PSR is interested in nothing much other than taking in money for having companies registered with the body. I’ve yet to see any evidence that they’ve taken action against anybody for behaving in an unethical fashion, but perhaps you can provide evidence to the contrary. To date I’ve found it to be another utterly useless government Quango. Has the PSR recovered money for you in your own instance? I found out that the company I was chasing was not registered. However, they paid up the moment I threatened to report them to the regulator. Consequently, I cannot speak with regards to any dealings with the PSR, as I did not require their services in the end. People need to find out Extra Sales’ licence number, as well as that of the directors and the sales reps they spoke to, as these must be included in any letter to the PSR. I accept your concerns over the success of this method (you would be more experienced in this than me), but watching the way the people I was dealing with folded at the slightest threat of reporting makes me think this should be the first step regardless. I wouldn’t know where to start looking for licence numbers. Perhaps you, or some other reader, could enlighten us. would you mind passing on the name of the company with which you were dealing (privately via email to info@diarmaidcondon.com) as I like to keep abreast of who’s doing what in the market for future reference and to enable in the assistance of others who may run into problems. As part of the repayment, I agreed that I would not publicise anything about what happened. Which is why I am writing on a thread that deals with the same industry, but not the company in question. I purposely avoid any thread which includes them and would remove any of my contributions should their name arise. I do understand fully Roberta, but don’t agree with the practice. As you’ll see from a previous comment of mine, this is a tactic that Extra Sales also uses on a very regular basis (it has resulted in at least six Extra Sales ‘clients’ remove negative comments they’ve made about the company on this post alone). It helps contain bad publicity somewhat and allows them to go on catching unsuspecting victims that might otherwise be forewarned. Incidentally, there have been about half dozen other comments, all critical of Extra Sales, removed from this page by victims of the company who ultimately got money refunded in some way. ES agrees to pay some or all of what it owes under the strict proviso that the person removes their posts from this site. ES is obviously watching this page very carefully and managing the surge of ill-feeling toward the company’s modus operandi as well as it can. I suggest that anyone who has a complaint contact the Property Services Regulatory Authority immediately. +353 1 484 7033 – i have since learned this is a rented address ( virtual office ) where they pay a fee to use that address and the number is a rented number that goes to a call centre to make it look like they have an office and they are not even in that building so i will try this Property Services Regulatory Authority immediately. Hi Martin, send Boylan a registered letter stating you want your money back within 10 days or your going to small claims court. It’s worked with previous clients but sadly they have removed their posts afterwards. Be firm with Boylan and don’t be disarmed by him which he is very good at doing. You will be lucky getting Horan on the phone. Good luck feel free to ask for advice as I was in your shoes took the case and won. Looks like Extra Sales is gone under… website is down..Games up. you cant keep a good fraud down. They duped as many people as possible into giving them cash to sell their properties and lodged that money into a Bulgarian bank account that earned 9-10% interest ,then dragged the process on as long as possible to maximise their returns. Now that the game is up its time to fold the LTD company and walk away without any obligation to its debts. Well done Boylan and Horan, great to see the Irish sliveen is alive and well. Totally agree Brendan,, they have sloped away, not picking up the phone. Jesus such a farce. They profited off peoples misery and couldnt care less for the want of better words. They both are professional sliveens. Boylan hangs out in Irish bars in Sofia when hes there. Horan has probably gone back under his stone in some pond. Paul ,I have learnt a valuable lesson about who to deal with in the future. If I meet a smiling, slimy snake who uses phrases like “with the help of God” and “please God” I will know what he is up to and its nothing to do with God, its a thief with the blarney. This is my last post, thanks again Diarmaid for having a blog like this to highlight this dodgy company or former company as seems to be the case. Canada is really cold now, they say Sofia is nice this time of year. Maybe I could meet an old friend for diner there. hi i also gave boylan 1500 euro for two properties, which i now want back as this company is a scam, they have since re named the company on the 2nd of october 2014. Both Boylan and Horan are directors. When i asked him about this he said it was a new venture. My biggest concern would be are they selling our properties without our knowledge. He keeps sending me email links of my property but its only a software link. When i asked before to see the russian site they said it couldnt be viewed here. Keith send Boylan a registered letter saying you want your money back in 10 days or take him to the small claims court. They have paid some people off on this who sadly withdrew their comments after been paid. Turn the screw on Boylan and Horan. They changed the name of the company because of the bad PR they were getting. I started this off, bet they rue the day they took my money and led me up and down the garden path. If you want advice I’m happy to to help you. No problem. They must be stopped. I sent Horan a private FB message a few weeks back, he ignored it. Think it’s time to push a button and expose these. The Russian market is dead in the water they are trying to squeeze any owners desperate to sell for the marketing fee. I will be sending a letter to the following address in the coming days asking them to at least have a look these guys antics because I am pretty sure what they do constitutes fraud. I would advise everyone affected by this company do the same. Enough letters and they will be investigated. Goldcity - where are my proceeds??? Long story short, Sean Boylan took the sales proceeds from the sale of my apartment (which were meant to come into my bank account directly). First, never told me the apartment was sold – a third party confirmed it for me. Then denied he ever received the proceeds. Alleged the Turkish contact was holding the funds. Then it was being “held in escrow” by an independent third party he didn’t know the name of! why money would be held in escrow for an asset that has already been received by the buyer????? Hello!! !…..point blank denied that this made no sense (he has seen this all the time in Bulgaria…..hmmmm…) and insisted the proceeds were with this mysterious third party based in turkey. Finally I got in touch with the Turkish contact involved in the sale and he sent me the details of the bank transfer he HAD made to Boylan’s account SIX months previously. So for SIX months, he lied with many excuses, including death in the family, death of a friend (? ), training seminar, travelling in turkey and meeting with the Turkish contact to get the money out of them (three trips) and so on. Whilst in actual fact, he had already received the proceeds. The latest line is that oh sorry that money was sent to an Extrasales account and as ES is in liquidation, oops!….so he had nothing to say for himself when I said that I had already confirmed with the liquidator Tony McBride that the account the money went to was not an Extrasales account. And for the account it did go into, I have the BIC and IBAN and the name on the account is Sean Boylan. Have made a statement to the Gardaí and the fraud squad is the next step. Have contact his solicitor who has not replied to my communications. So Longmemory, would be interested in what you have to say and Diarmuid has my email details if you want to get in touch. I have evidence that he is still trying to sell for investors in the same development in Turkey (Sept 2015). Please contact me if you feel you need more info. Anyone who is in this position, or who has reported Sean Boylan or Extrasales to the authorities (Gardaí, Fraud squad, PRSA, any UK authorities), please contact me. Out of curiosity did Boylan pay you what he owes you? What happens to you has just happened to me in Bulgaria.I have to say it’s a long story but exact same .Sold my apartment in sept and told me it wasn’t sold until I confirmed it with a third party.Actually took pictures of someone living in it.Confronted Aidan Davey and Brian Conneely both from Galway and they said no way wasn’t sold .Then I showed them pictures then they said the new owner was sick and money wasn’t transferred yet.Hang on I said you sold my property where the proceeds.What makes me sick is that my sister in law know this Aidan Davey and he meets her in Galway and he says its all been sorted it’s not.Just wondering how or who do I report these thriving …….to and what should I do now.I have started proceeding in Bulgaria against so called Alex who has the funds.Any advice would be great.You can email me at hanrachan@hotmail.com.Love to know if anyone else had dealings with these two. Just for clarification, my understanding here is that the responder is referring to the directors of West Incorporated (now rebranded as West Project Management) rather than Extra Sales – http://westincorporated.eu/site/about-us. Yes that is correct.Do you know or have you heard of any other persons having problems with this company?I have still not recieved any funds from the sale.They have told me that if the buyer doesn’t come through with the money that the deal will be void and that they would take over the deal and pay me.I have raised my concerns but still no reply. If you haven’t already done so I would have a Bulgarian solicitor check on the title deeds to your property to make sure it has not been sold already. If it has been sold and you’ve not received funds then there is an issue, depending on when it was sold. You should also check the Power of Attorney you signed. Who this was signed over to is very important as, if you were to make a legal challenge, it would have to be in the jurisdiction of the PoA. If you made it out to a Bulgarian company then there is no point in going after it legally. If you made it out to an Irish individual then there may well be some merit in following it up legally. It may be that you just have to report it to the Fraud Squad in Harcourt Street. Thanks for reply.Yesi have got Bulgarian solicitor onto it and he checked with the notary and yes the property was sold and deeds are now in new owners name.Brian connonolly (owner of west incorporated)and Aidan Davey(both Irish passport holders)organised the deal and it is Aidan Davey name and another guy called Alex (whose Bulgarian ) that are on the power of attorney.My lawyer in Bulgaria has served papers to Alex person in bulgaria(they were handed to him by a police officer)and he has 15 days to pay up or court will follow my solicitor said.I called Aidan Davey and asked him where the money was from the sale and he says it has nothing to do with him an not to be bothering him(the cheek)I reminded him that his name is on the POA and I hold him responsible for the funds not been transferred.I am livid and want the fraud squad to investigate both Aidan Davey and Brian connelly and have them arrested for fraud. Is there a special part or department at the fraud squad I should contact? Also just wondering how can I legally go after Brian Connelly as he seems to think he is ok as he’s not on the paperwork but it was he who met me in Galway at the notary and organised the signing of the paper work.Just one more thing diarmaid I was considering contacting the notary in Galway as well to advise him of what has happened.Should I do this? If Aidan Davey’s name is on the Power of Attorney then you may have a case against him in Ireland. Although with two names on it both are likely to say the other is at fault. It is certainly worth running it past an Irish solicitor to see if there is merit in it. I would definitely report it to the Fraud Squad in Harcourt Street on 01 666 3776. If they’ve done this to you it is very likely that they have done, and are doing, it to others as well. The sooner they are stopped the better. Your action in Bulgaria seems perfectly valid, although from experience, such cases taken overseas against individuals rarely result in a positive financial result for the plaintiff, even if they win. Getting the money is often a lot more difficult than winning the court case. Extrasales have set up under another name but it’s the same dribble. I don’t know how successful you would be if you took a small claims case as they operate under a different name. They knew this. My advice is to make sure they can’t sell it for you and make this an urgent priority if I were you. Some people contacted me with horror stories which I can print here as I can’t verify them but if they are true then make sure through your BG solicitor that only you can sell the property. The mess these guys (extrasales) have caused is incalculable. Maybe contact the fraud squad with exactly what you have stated. Looks like the 2 boys could be feeling a bit uneasy… About time. Delighted for them. Thanks David, such great news. Hopefully this will end Boylan. Hi My partner and also another family member paid Extra Sales over €1000 each to sell their overseas properties. After a few months when we heard nothing back, the family member decided that she wanted her money back – as they had not sold the property in the timeframe they agreed. She had to send them a solicitors letter, and call to the property in Dublin. I agree with the poster above that it must not have been their office at all as the receptionist there who worked for a different company would not let her in to wait in the ‘waiting area’. At the end she got her money back, but my partner decided not to pursue getting his money back as he was sucked in by all their promises and lies. I hope Boylan has paid the money. Looks like I’m a bit late coming to this sorry excuse for a party. I’ve contacted the liquidator to add my name to the list of those duped by Extra Sales. I believe my next option is to contact Store Street Garda station to add my details to the list of complainants. I have seen the fresh comments on the site about other companies that are attempting to back end clients. Sadly its not only Extra Sales. Worth noting, If anybody wants a property checked out here in Bulgaria, let me know. Im based here and I was also a victim of Extra Sales so I know the situation. Ive checked a few properties here for clients and sadly they were being rented without their permission and in one instance a property was sold without the owners knowledge. This is also often done at a local level by agents and property managers that have access to your property or POA you gave someone. So if youre suspicious and want a discreet check anywhere in Bulgaria let me know. In January 2013, at a vulnerable time in my life, I gave Extra Sales €1500 ( Jimmy Shields) to sell my Turkish property. Due to a number of significant family health issues which warranted my full-time focus therefore I have not paid any attention to this issue. However recently checking my property documents, I came across my agreement with After Sales and taught I must contact they people. Goggling this today I came across your interactions. They did not request and do not have POA, therefore my property in Turkey is fine with no issues from After Sales except they have my €1500. Can you please advise is there anything I can do at this late stage. Thank you. as long as they don’t have a POA you’ll be fine, but you’ll not be getting the €1,500 back I’m afraid.